The Chocolate Café in Upper Arlington can be summed up in one syllable (and one letter, at that): mmmm. This chocolate cake, warmed up and serve à la mode, was spongy and gooey (and when I say that, I mean it in a good way). They’re open late, especially on Fridays and Saturdays, which makes for a great place to go when you’re craving a midnight snack on a weekend. The atmosphere is casual, and the food is reasonably priced. This case full of scrumptious round brownies literally made my mouth water! Sugardaddy’s is a local chain that serves up a host of specialty brownies that are not only ridiculously tasty, but also perfectly round. These “sumptuous sweeties” come in three different categories: brunettes, blondes, and fire & spice. A friend and I tried out two amazing desserts (pictured below): the Caramel Brunette (left) and the Tahiti Blonde (right). Paired with a small carton of milk, these treats were just the pick-me-up we needed in the middle of a busy afternoon. As if the food wasn’t enough incentive to get yourself down to a Sugardaddy’s near you, the decor was also very hip: multiple shades of pink, swirly designs, and trendy lighting accents created a really fun and contemporary feel. I’ve been hearing about Pistacia Vera ever since I moved to Columbus, and I ate there for the first time last month. Why I ever waited so long is beyond me — just look at the Chocolate Bombe (pictured above) in all its glory. I can’t even begin to describe the beauty of eating that luscious dessert. But since I went with three other people, we each got a dessert so we got to sample four different treats! The Flourless Truffle pictured here was amazing. With flavors of chocolate and raspberry and passion fruit, it was a dessert I’d fight someone for. Seriously — I couldn’t believe how delicious it was. Just look at those layers of rich flavor…. And to counter the richness of the Flourless Truffle, I ordered the Lemon Tart (pictured below). It was a refreshing and light tart that really hit the spot on that particularly humid September afternoon. The crust was also scrumptious. I mean, just look at it! How can you not want to stick a fork in that? And of course, the last of the four desserts: the Pistachio Strawberry Dacquoise. I went to my first-ever state fair yesterday, and it was the Ohio State Fair. Of course, Ohio being the Buckeye State, a friend encouraged me to try the fried buckeyes. 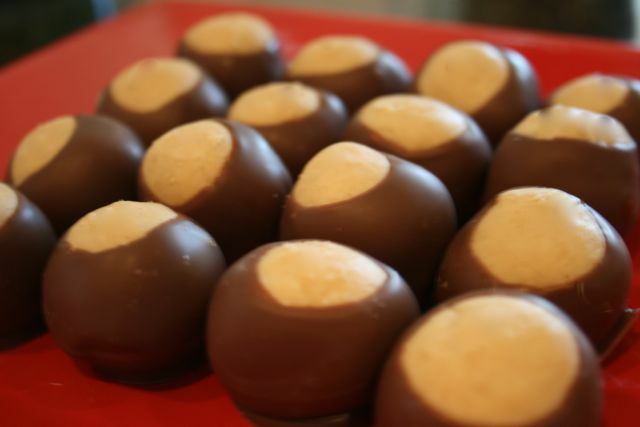 While the buckeye nut is poisonous, nobody eats it — instead, they eat a dessert called buckeyes (peanut butter balls dipped in chocolate). I was apprehensive at first, but as soon as I saw them batter the buckeyes, I knew it was going to be delicious. The chocolate coating on the buckeyes melted right into the batter upon frying, leaving the peanut butter ball soft and warm. The powdered sugar and chocolate syrup topping off this treat-on-a-toothpick just made it that much more scrumptious.Another state fair delicacy I experienced was cotton candy…but this was no ordinary cotton candy. No, this treat is un-dyed cotton candy made from maple sugar. For the first time in my life, I realized just how appropriate the name “cotton candy” is for this sugary treat. Just look at the picture below, and you’ll understand how I initially mistook this sweet for a bag of actual cotton. The maple sugar gave it a distinctive flavor (if you’ve ever had maple syrup, this should be too difficult to imagine), and it was as light and fluffy as this carnival dessert always is.